Upon registration, new members at Littlewoods Casino are eligible for a £100 Welcome Bonus. It starts off with a 50% matching bonus up to £50 as soon as the first deposit is made. The free cash is automatically added to the player’s bankroll. This is followed up with an additional £50 as soon as a required number of comp points are reached while playing games online. Thanks to its creation of the original Football Pools, Littlewoods has been a household name in the U.K. since 1923. 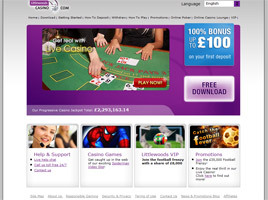 When Sportech PLC acquired Littlewoods Gaming in 2000, the London-based company immediately set its sights on creating the same level of familiarity on the Internet, resulting in the launch of LittlewoodsCasino.com two years later. Today, the web site offers more than 100 games and betting opportunities, along with links to Littlewoods Poker and Littlewoods Bingo online plus an affiliation with the GameOn suite of slots, table games, scratch cards, and other E-gaming options. Although instant-play games are readily accessible through Sportech’s GameOn QuickPlay web site, the original Littlewoods Casino has remained available purely as a download version. Once the casino application has been installed using the Download Wizard, a registration form must be completed. Thereafter, a window pops up offering access to the games in either Money Play or Practice Play mode. Upon arrival in the Littlewoods Casino lobby, colored game icons indicates which games have completed downloading and are ready for play. Any games with black & white icons are still undergoing the download process. Clicking on the Cashier button opens the player account for making an initial deposit if Money Play is desired. Table Games at Littlewoods Casino are rather limited, but scarcity can have its advantages. Crazy Blackjack and Multi-hand Blackjack are the only variations available to Classic 21, making the decision of what to play rather easy. Other games offered here are Baccarat, Craps, Pai Gow Poker, Caribbean Poker, and Triple Card Poker. A Keno game is also available. Slots, on the other hand, are divided into three categories: Video Slots, Classic Slot Machines, and Classic Video Slot Machines. There is also a popular Video Poker area, stocked with all the traditional games players love: Jacks or Better, Bonus Poker, Jokers Wild, Deuces Wild, Aces and Faces, and Royal Diamonds. One 50-hand version, Power Video Poker, deserves some play, too. Specially featured are the latest multi-reel, multi-pay-line slots, such as Spiderman, Fantastic Four, and the destined-to-be-a-classic Bejeweled. Six Classic Slots have been set up as progressives, with seven-figure Jackpots up for grabs. Two of them—Millionaire Genie and Super Thundering 888—not long ago topped £1.8 million. One of the newest innovations at Littlewoods Casino is a Live Casino icon in the Casino Lobby. Just a click on it takes players to live-action tables for Baccarat, Blackjack, and Roulette. From there, talented young female dealers are streamed to the computer desktop via a real-time video feed. Littlewoods Casino offers a number of generous bonuses and promotions, ranging from matching cash for deposits to special giveaways. There are also periodic tournaments with Leader Board prize pools and a Happy Hours Blizzard once a month. Comp Points are awarded at a rate of 1.5 for every £10 bet. They can be redeemed at a rate of £1 for every 150 Comp Points earned. How many Comp Points are available to convert into cash can be checked anytime by clicking on the "Comp Points" icon in the Cashier section of the web site. A number of VIP promotions have also been created for high rollers and steady customers. Consideration for VIP status requires the accumulation of at 150,000 Comp Points and the deposit of at least £2,500. All promotions, bonuses, winners, an tournament leaders can be found listed in the Online Casino Lounge, which also features blog entries, articles on winning strategies, and helpful links to Casino Resources.